In today’s Rolland Moore Park four-kilometer run—the first race of the Fort Collins Running Club‘s 2007 Tortoise & Hare Series—I had a couple of objectives: 1) to test out a new pair of Puma H-Streets, and 2) to finally prove to myself I can run well in cold weather. The Pumas are my replacement for the 1000-mile Nikes that served me so well last year. Never mind that the H-Streets are—as my friend Lisa had described—“like socks” and will probably last just 200 miles instead. They are super light! According to my digital scale, they weigh less than a few pancakes, as in 5.8 ounces. 5.8! 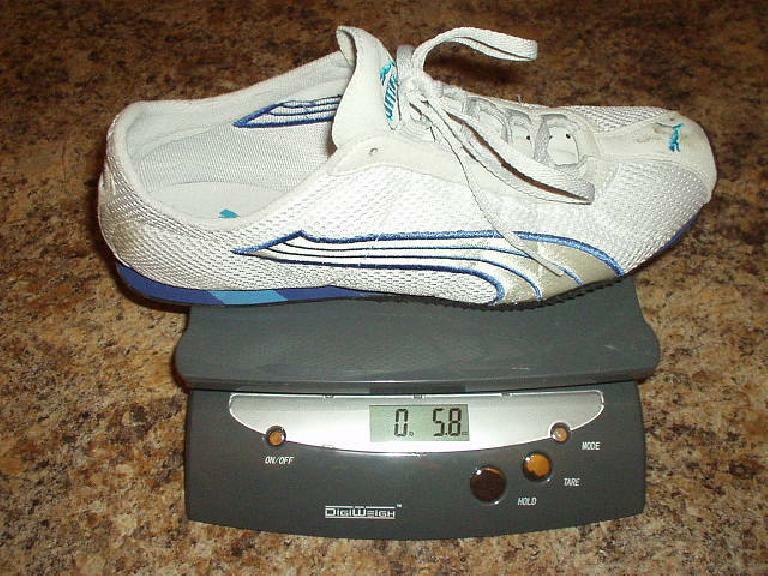 I already thought my last pair of Nike Air Zoom Elites were light at 10.4 ounces (especially when considering the pair of Nikes I used in the 2002 California International Marathon were over 14), and the Pumas are almost half the weight! They also look pretty cool, yes? My friend Nick stated that they look like racing flats. In the race, they turned out to be supremely comfortable too (as a sock would be). They offer minimum support and cushioning, making them a favorite of the followers of the Pose method of running. They almost force you to (correctly) run on the balls of your feet. My verdict: I really like them. I really felt fast on them, and that alone was enough to make me forgive their slipperiness on icy sections of the trail where only crampons would have helped. Too bad, then, that these shoes befitting of the Road Runner resulted in yet another race finish more suitable of Wile E. Coyote. Why? Because once AGAIN, my navigation system (i.e. the fatty matter within my skull) had a malfunction. Yes, I got lost! This happened when, at a fork on the Spring Creek Trail, I neglected to look at the arrow chalked on the pavement and went left instead of right. After a quarter-mile on this offshoot I ended up in some random neighborhood. Whoops. I turned back around and got back on the course, but lost a total of about three minutes. Well, at least there is one unofficial category in the Tortoise & Hare series I am leading in now: highest number of “extra-credit” yards added on to the middle of the race. Also, this time I was not disqualified like I was in last November’s Eldora Park 8k. This is because it was cold enough that the official timing device did not work and no times were recorded. Ha! I also did manage to finish second-to-the-last, which is my usual customary position in the “handicapped” series (where start times are staggered with the fastest runners going last). So despite getting off-course, my finish placement was no worse than usual. Too bad, though, I once again failed to prove that I can turn in a decent race performance when the mercury has dipped well below the freezing point of water. Well, there may be other opportunities this year. I was probably running just under 7-minute pace in the first half, or ~1.6 miles. Therefore, I probably ran 2.9 miles instead of 2.5 (4k). 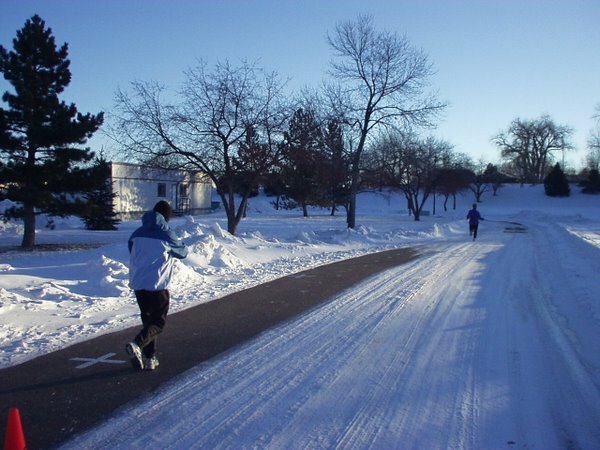 Note that ice and snow on the pavement slowed all of us down at times, so time splits were not really an accurate indicator of effort. I just bought a pair of H Streets as well and have been running in them for the past week. I’m trying out POSE and ChiRunning techniques to see which one I prefer.